We’re on a mission to certify 100 new lifeguards annually. If you think competitive swimmers don't need safety vigilance, or that they are automatically capable of providing lifesaving measures if needed, think again. Even the most experienced athletes can require urgent assistance in the pool at any moment. The Swim4Elise Lifeguard Challenge helps qualified young swimmers and coaches become certified lifeguards. We provide full scholarships for American Red Cross lifeguard training programs (~$200 per person) to competitive swimmers, divers and USA Swimming Coaches ages 15 and up who apply and are approved under our program. What is the Lifeguard Challenge Certification Scholarship? Through our Lifeguard Challenge, Swim4Elise will select and sponsor 100 applicants to attain their American Red Cross lifeguard certifications. 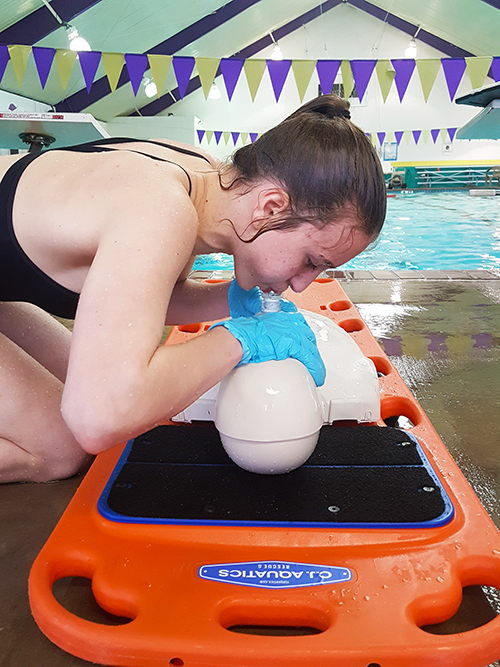 While lifeguard employment is optional, completion of certification will expand participants’ water safety knowledge and equip them with lifesaving skills. Lifeguard Certification Scholarships will cover all tuition costs associated with certification and will be paid directly to North Star ASI, the Swim4Elise Red Cross partner, unless otherwise pre-arranged. Who can apply for this scholarship program? We are seeking current USA Swimming Athletes and/or USA Swimming Coaches from the North Texas LSC, as well as current high school swimmers, rec team swimmers, competitive divers, and high school swim coaches, who are committed to improving swim safety by earning lifeguard certifications. All swimmers and divers must be between the ages of 14-19 (turning 15 by the last day of the lifeguard course). All applicants must be physically able to meet the requirements established by the American Red Cross, as listed below. What are the specific Lifeguard Challenge Scholarship guidelines for swimmers/divers? Within 1 minute and 40 seconds: Swim 20 yards, dive 10 feet, retrieve 10-pound brick, return to starting point with brick, and exit pool from side. What are the specific Lifeguard Challenge Scholarship guidelines for coaches? What are the American Red Cross Lifeguard Certification Requirements? Do I have to apply for a scholarship to be counted in the Lifeguard Challenge? No! Any qualified swimmer, parent, coach or friend who is willing and able to earn lifeguard certification through the American Red Cross in honor of Elise is welcome to be counted in our 100 Lifeguard Challenge without a scholarship! If you obtain your certification on your own, just send us an email with a photo of you & your new credentials, and we’ll add you to our recipients page (with your permission) and goal count. First, all applicants must complete all required portions of the nomination form in their entirety. The form requests signatures of consent and recommendation to verify the applicant’s commitment and physical capabilities. USA Swimming Athletes should provide supervising coach signatures. If the applicant is a high school/rec swimmer or diver, s/he should optionally provide a signature of recommendation from another coach (supervisor or peer). All minor applicants (ages 14-19) must also provide a parent’s signature. When the form is complete, prepare a digital copy (PDF, JPG, etc.). You’ll be asked to upload it in the next step. Next, applicants complete and submit the online Lifeguard Scholarship application. After anonymous review by the Foundation’s Board of Directors, approved applicants will be notified monthly. APPLICATIONS END ANNUALLY WHEN WE HIT OUR 100 LIFEGUARD GOAL! If approved, swimmers, divers, and coaches will need to complete their American Red Cross lifeguard certification course within six (6) months of approval. If the swimmer/diver is applying for the college scholarship, they must complete the lifeguard course by March 15. All associated fees will be paid directly to North Star ASI (or other pre-arranged certification facility) by the Swim4Elise Foundation.